Bolt, who is plying his trade at A-Leauge's Central Coast Mariners on an "indefinite training period", scored a double in their pre-season friendly match against second-tier side Macarthur South West United in Sydney on Friday. Watch the two goals here. Eight-time Olympic champion Usain Bolt is no more outrunning the fastest men in the world but the sprint great, it seems, will continue mesmerising his fans on the football turfs in Australia. 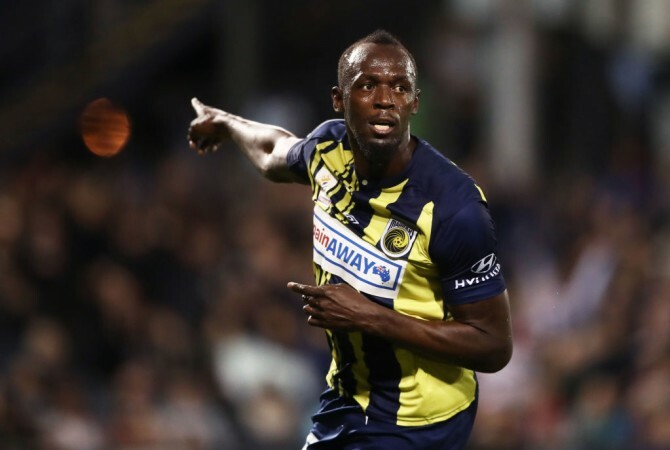 Bolt, who retired from track and field in 2017, scored his first professional goal for a football side when he scored in the second half of A-League side Central Coast Mariners' 4-0 win over Macarthur South West United in a pre-season friendly at Campbelltown Stadium in Sydney. The 32-year-old put the Mariners 3-0 up with a powerful left-foot strike that went low past the keeper. He did well to a control chipped ball played by Scotland striker Ross McCormack and held off the Macarthur defender. Bolt doubled his tally minutes after the first strike by tapping in from close range following a mixup between a Macarthur defender and the goalkeeper. The 100m world record holder, who had training stints at Bundesliga giants Borussia Dortmund, South Africa's Mamelodi Sundowns and Norway's Stromsgodset, joined the Mariners for an "indefinite training period" in August. He had made a couple of appearances before Friday's match for the side that finished 10th in the last A-League season. Witnessed by more than 6,000 people at the stadium, Bolt broke into his trademark celebration move after the first goal. When he was subbed off in the 74th minute of the match, the crowd booed as they wanted a hat-trick for their sprint hero. Bolt could have ended up with more if not for some blunders in the first half wherein he missed easy headers. Nonetheless, the Jamaican sprint legend said he is proud of his effort. "I think I made some slight mistakes but it's my first real game with the first team. I'm just happy I got a chance and I'm proud of myself," Bolt said, as quoted by news.com.au. "It was a big deal, scoring a goal in my first real match is a big deal. To score two goals, it's a good feeling, it's what I'm working towards, I try to improve myself, I try to get better and I'm doing that." Despite scoring the double, Bolt's performance against Macarthur, who play in the second-tier competition, was far from impressive. It remains to be seen if the Mariners offer him a professional contract ahead of the new league season, starting October 19.